Acute lung injury (ALI) is a syndrome characterized by damage to the alveolar-capillary wall, pulmonary edema and recruitment of inflammatory cells. Previous studies have indicated that aquaporin 4 (AQP4) plays a key role in brain edema formation and resolution. However, the role of AQP4 in the development and progression of ALI is not clear and needs to be resolved. In our current study, mouse ALI was induced by intratracheal instillation of lipopolysaccharide (LPS) at a concentration of 30 mg/kg. For the inhibition of AQP4, 200 mg/kg of TGN-020 (Sigma, USA) was administered intraperitoneally every 6 h starting at 30 min before intratracheal instillation of LPS. 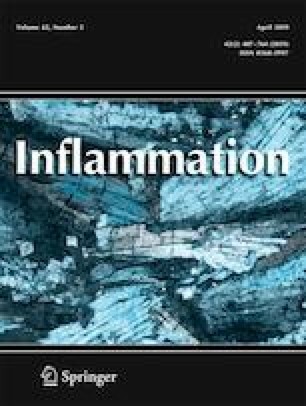 The results of the present work indicate, for the first time, that mice treated with the AQP4 inhibitor TGN-020 had attenuated LPS-induced lung injury, reduced proinflammatory cytokine release (including IL-1α, IL-1β, IL-6, TNF-α, IL-23, and IL-17A), and an improved survival rate. Additionally, we found that the attenuated lung injury scores, increased survival rate, and decreased BALF total protein concentration in TGN-020-treated mice were all abrogated by rIL-17A administration. Furthermore, TGN-020 treatment downregulated the phosphorylation of PI3K and Akt, increased the expression of SOCS3, and decreased the expression of p-STAT3 and RORγt. In conclusion, inhibition of AQP4 by TGN-020 has a detectable protective effect against lung tissue injury induced by LPS, and this effect is associated with inhibition of IL-17A through the downregulation of the PI3K/Akt signaling pathway and upregulation of SOCS3 protein. Cheng Guo and Tin Wu contributed equally to this work. Experiments were approved by the Institutional Animal Care and Use Committee at Hubei Province Academy of Traditional Chinese Medicine.